Nina Noa, lady of the house, crazy catwoman, tattoo-artist, illustrator, shopmanager and co-organiser of “de Museumsessies”. 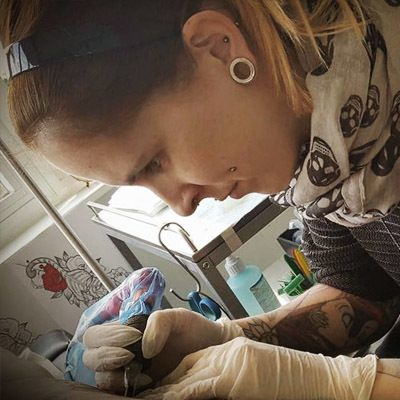 Nina has been passionate about drawing since childhood and after finnishing artschool pursued her dream of becoming a tattooartist. Soon after recognising her talent , Vincent invited her to join the team 2014. Nina combines the graphism of the neotraditional tattoo style with influences of art nouveau and art deco, translating mythological and surrealist themes into unique tattoo-designs. Ninas on paper illustrations combine elements of popular culture, humor and wordplay, surrealist settings and human-animal hybrid characters. When she is not tattooing, she is drawing or petting cats, but mostly drawing.